Badges? We don’t need no stinkin’ badges! Or do we? We always appreciate all the hard work spent transcribing records on Notes from Nature, and we want to celebrate your accomplishments. As you gain expertise on Notes from Nature, you earn badges that are added to your “Transcriber’s Life” page (if you have a Zooniverse account — its so easy to get one, and totally worth the 20 seconds it takes to have it). When we launched Notes from Nature, we had badges for SERNEC and Calbug. Since some you might not know all the badges available, and since, right now, we only show three on each “collection page”, I wanted to walk you through them all, especially because we just added some new ones! In particular, we added one new badge for SERNEC and CalBug, and three new badges for our Macrofungi project. 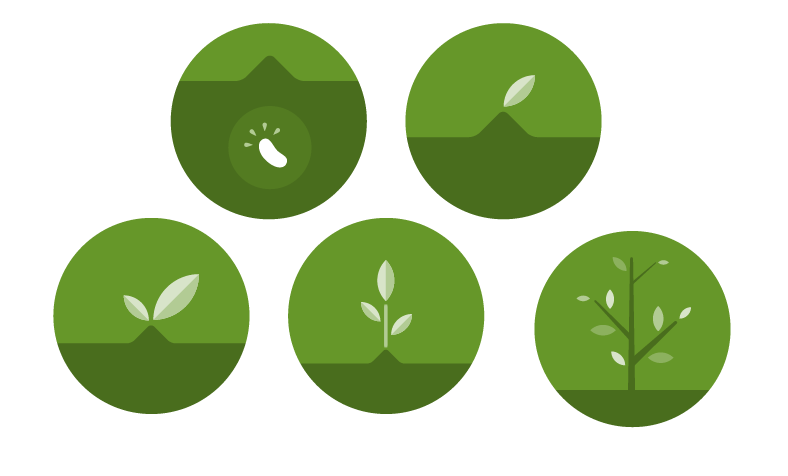 Here are the original 5 SERNEC Badges (representing seed, sprouts and young tree), earned when you transcribe 1,10,25,75,and 250 records. Now you can earn a “mature tree badge” for 1000 records transcribed. Here are the three original Calbug badges (egg, catepillar, and butterfly), earned when you transcribe 1,25, and 100 records. Now you can also get the “butterfly swarm badge” when you transcribe 500 records. And introducing the new Macrofungi badges (spore, mycelium, and mushroom) for transcribing 1,25,and 100 records! Sweet! We hope you want to earn all 13. I guess we do like and need those badges, and we hope you do too. Notes from Nature is something of a departure for a Zooniverse project. Rather than a single organization asking for help with the exact same tasks, Notes from Nature is, like its subject matter, diverse. So we have labels of bugs, sheets of plants, fungal specimen labels, and ledgers of birds. And we have a lot – and I mean A LOT— of images that need transcription. Not only that, but each of those images are transcribed more than once—as mentioned in previous posts, right now each image gets 4 separate transcriptions. All of this is preface to the main topic of this post – how do we measure “progress” with the tasks of transcribing all of this data. The science team on Notes from Nature has talked a lot about this, and a number of complexities related to making sure that the numbers are transparent to you, our volunteers. This post covers a fair amount about how to measure overall progress. We also know that there have been issues with transcription counts for individual volunteers. We believe that we have solved those issues, but we’ll cover those separately in another blog post. Issue 1: Do we measure total number of transcriptions or total number of images that are “finished” (e.g. transcribed four times)? Solution: We have decided to measure total transcriptions completed across all projects and within projects. This is a change from our previous strategy which had mixed and matched these different counts on different pages. We think the most obvious measure is overall effort put in, even if this means it is harder to know how many images have been done. Issue 2: Should we even measure “completeness” within a project (e.g., Calbugs)? The reason this is an issue is that most projects on Notes From Nature have only posted a small subset of available images and there are many more “waiting in the wings”. We don’t want to say “hey, only a 1000 more images to transcribe” and then just a little later go “Oh! Just kidding, there are now 50000 more!” Our ultimate goal is to stage the many remaining images as smaller batches with compelling themes derived from their research or other societal values (e.g., all specimens from a particular national park or collected by an important historical figure). This will give us a chance to celebrate the success of completion more regularly. At the moment, we are seeking funding to do this. total images – The number of source images currently available. active images – The number of images that are either in progress with being transcribed or waiting for transcription. We hope the new changes lead to greater transparency! We are also so awestruck and appreciative of all the participation as we pass the 5000 registered participants and 400,000 transcriptions mark- we can’t thank you enough or tell you how important the public participation has been for this endeavor. Finally, we love comments and suggestions. Please feel free to provide some, and we’ll get right back to you. Macrofungi Added to Notes from Nature! The Notes from Nature team is excited to announce the addition of content from the Macrofungi Collection Consortium! This collection is a partnership of 35 institutions across the U.S that collectively will digitize about 1.5 million specimens that have been collected the past 150 years. Macrofungi are important to humans in many ways – many people like to eat them, but some species are also deadly poisonous. Macrofungi are also key to the health of our forests – indeed, most forest trees could not survive if their roots did not form a relationship with a macrofungus (called mycorrhizae) that helps tree roots absorb water and minerals from the soil. Macrofungi are also an important source of food for forest animals and they serve as homes for many soil insects and other small organisms that are also part of a healthy forest ecosystem. Many macrofungi are very beautiful, and are the subject of nature photographers. Their pigments may be used for dyeing wool or cotton, and for paper-making. Macrofungi are important religious symbols in some cultures. Recently it has been discovered that macrofungi can play a role in the cleanup of environmental disasters. Through a process called “mycoremediation” macrofungi are able to break down or remove contaminants such as pesticides and fuel oils. The Macrofungi Collection comprises mushrooms and related fungi. After collection, specimens of macrofungi are dried on a vegetable dehydrator or similar type of dryer, and then are placed in a box or packet with a specimen label that gives the name of the fungus, when, where, and and by whom the specimen was collected. Because macrofungi are often very short-lived, documenting their occurrence with specimens is critically important for knowing which macrofungi grow where. To help scientists answer the many remaining questions about these foundational organisms, they need access to data from collections. Our project is to digitize these specimens and make the data available in a standardized, searchable form through the MycoPortal. Although macrofungi (mushrooms and mushroom-like organisms) are not plants, they are still stored as dried specimens in herbaria. The dried mushroom (which often looks nothing like the fresh mushroom!) is stored in a box or paper packet and is accompanied by a label that that gives the name of mushroom, where it was collected, when, and by whom. You can contribute to a better understanding about these environmentally critical organisms by helping to transcribe data from the specimen labels into a structured format. The folks who are capturing the images of these specimens have already recorded the name of the fungus, so what we need your help with is transcribing the collection locality and date, as well as the collector’s name and number. If you want to learn more about macrofungi, there are many sources of information. Online, Encyclopedia of Life, which is also linked to the macrofungi collections in Notes from Nature, is a reference for images and descriptions of many of these fungi. Mushroom Observer is a site where citizen scientists and professional mycologists meet to discuss macrofungi of interest. There are also many clubs around the country where participants go on mushroom collecting trips, host lectures for members and teach the general public about these organisms. You can learn about clubs in your area through the North American Mycological Association website. Check-out a recent feature on Notes from Nature on the local NBC29 news station in Charlottesville, Virginia. Two billion specimens! The Notes from Nature team is proud to report reaching the new milestone of 300,000 transcriptions completed! This has been made possible by the generous and committed efforts of nearly 4,000 citizen scientists from around the globe. We look forward to continuing the project and sharing more biological collections with you in the near future. Thank you citizen scientists! To continue growing and expanding, we are interested in your feedback. What excites you the most from Notes from Nature so far? How would you like to see it evolve? Leave a comment and let us know!